Do you see that microphone button at the bottom left of the iPad screen when the keyboard appears? I always knew about the dictation feature, but I never really used it before a couple weeks ago. I’m actually writing this post by speaking it, all while in the car! The accuracy is quite good, there are rarely any mistakes if you speak clearly. I’ve been using it recently for a lot of things: text messages, emails, and blogging. When you are ready to dictate, tap the microphone. A sound will occur and you are then to begin speaking. When you are done, press it again. It will take a short couple of seconds to transfer to text, and the text will appear. You should then quickly glance at the text, making sure there aren’t any glaring errors. Do not speak too quickly, or else it might miss a word here or there. You can even add punctuation, so if you say “comma” in the right position, one will appear. Question marks and exclamation marks also work fine. As long as you speak clearly, and there is not much background noise (if at all). 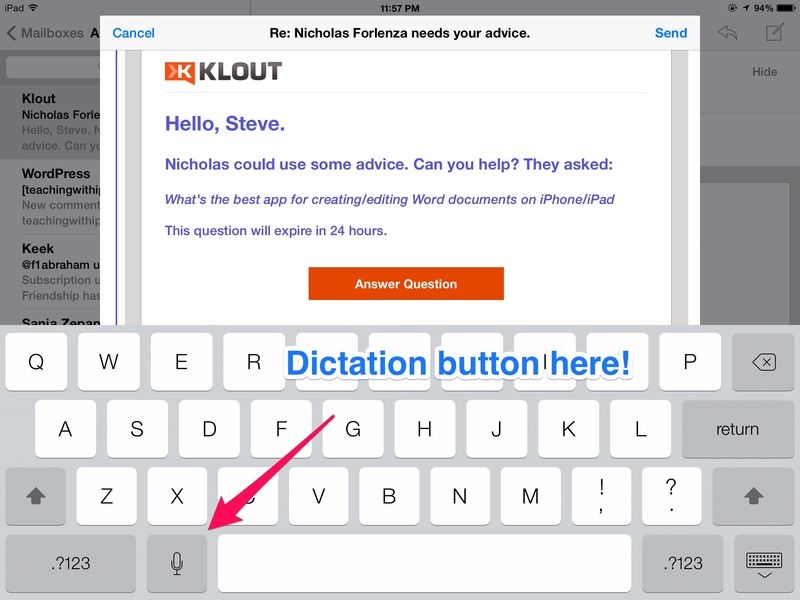 Voice Dictation will work any time a keyboard is required on ANY app. I have now been able to write a few blogposts using Voice Dictation and Evernote. Why Evernote? Because as soon as I have finished dictating it on my iPhone, I can go to my MacBook, open up Evernote, and the file will be the most recent file all the text already. I can then copy and paste the text onto my blogging platform do a few minor edits and that’s it! In terms of blogging, if I have arranged my thoughts and know what I want to share, then this is a much faster way to get text output. I recently told my mother about this feature, and now she iMessages me speaking instead of typing. She has arthritis, so typing on an iPad screen is not exactly easy. The obvious advantage of Voice Dictation for students is for those that cannot type very fast or very well. All they have to do is speak what they would like typed out. I know students who are very good speakers, can articulate their thoughts very well, but have a lot of trouble with written output, be it through handwriting or typing. This will work wonders for these students. They will feel much more accomplished when they see all the words that they have created just by speaking them. Although I’m not a slow typer on the iPhone, it is much faster speaking into it. I speak a few sentences at a time. I now am using it whenever I have a few free minutes and need to organize thoughts or reply to emails. While sometimes it is beneficial to “think and type” while writing, other times it is just plain easier to dictate what I want to say. This is a much appreciated feature that I can see myself using every day. 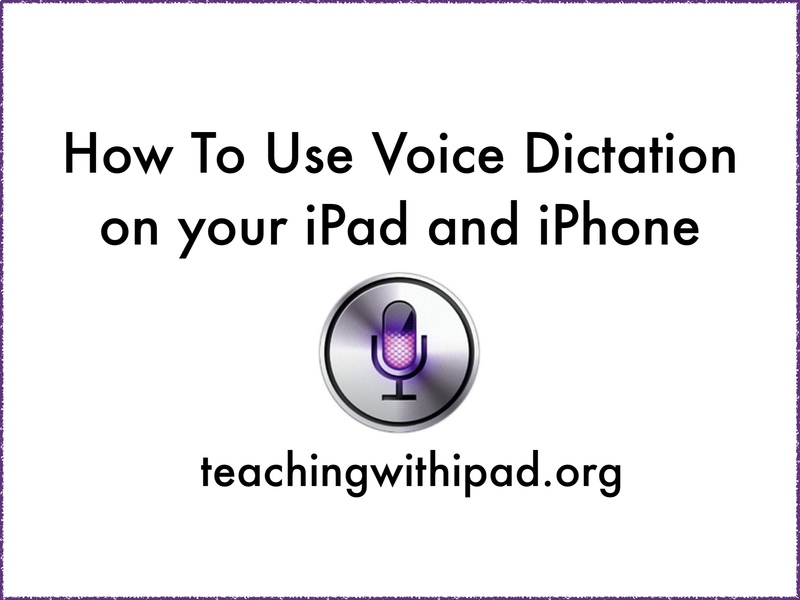 Have you tried Voice Dictation? If not, give it a go, and let us know what you think in the comments! Next Post Lost Your Apple TV Remote? You Don’t Need to Buy Another! Hi, I check your blog daily. Your humoristic style is awesome, keep up the good work!